Mashua tubers are small to medium in size, averaging 7-20 centimeters in length with the capability to grow up to thirty-three centimeters, and appear similar to potatoes but have a conical shape with one bulbous and one tapered end. The skin of the tubers ranges in color from yellow, white, orange, purple, red, to a variegated combination, and is thin, waxy, shiny, and very lumpy due to many deep-set eyes. The flesh is firm, dense, and moist, ranging in color from white to gold. When cooked, Mashua develops a crispy surface with a soft interior and has a pungent, peppery flavor similar to radishes, cabbages, and turnips mixed with licorice. Other parts of the plant can also be consumed including the leaves which taste like mustard greens and the flowers which have an anise flavor. Mashua is available year-round, with peak season in the fall. Mashua, botanically classified as Tropaeolum tuberosum, is a perennial climbing plant related to garden nasturtiums that can grow up to four meters in height and produces uniquely shaped, edible tubers, belonging to the Tropaeolaceae family. Also known as Tuberous Nasturtium, Añu, Isaño, Cubio, and Papa Amarga, Mashua is native to the Andes in Peru and thrives in temperate climates, prolifically growing in both cultivated gardens and the wild. One Mashua plant can produce over sixteen pounds of tubers, and the entire plant is edible, used in a wide variety of both raw and cooked culinary applications. In addition to its edible nature, Mashua is favored for its ability to repel insects and is often planted as a companion crop to other vegetables. It is also highly valued for its orange trumpet-shaped flowers, grown as an ornamental in home gardens. Mashua tubers contain vitamin C, some protein, and a compound known as glucosinolates, or mustard oils. In the garden, mustard oil is found in the leaves and is a natural deterrent for pests such as rodents and insects. Mashua tubers are best suited for both raw and cooked applications such as boiling, roasting, baking, and frying. The tubers can be used fresh, sliced or grated thinly and sprinkled over salads for a spicy, crunchy flavor, sliced into coleslaw, or pickled for extended use. While Mashua can be used raw, it is most commonly preferred in cooked preparations and can be prepared similarly to potatoes, boiled or roasted until tender. The tubers can also be cubed and incorporated into stews, soups, and curries. Mashua works well in strongly spiced dishes such as Indian food, especially with the spice cumin, and are typically cooked with fatty meats to add flavor. In addition to savory applications, Mashua can be boiled, frozen, and consumed as an unusual dessert or soaked in honey and molasses for added sweetness. The leaves can also be consumed and are commonly added to salads, used as a green wrap, or are boiled and served as a side dish. Mashua pairs well with honey, cumin, coriander, cinnamon, lemon juice, shrimp, poultry, pork, beef, tofu, sweet potato, mushroom, squash, corn, rice, and black beans. The tubers will keep 6-8 weeks when stored at room temperature and for a couple of months when stored in ideal conditions in a cool, dark, and humid space. Mashua was traditionally eaten by the Incas in Peru, Bolivia, and Colombia, and images of the tuber have been found on pottery that dates back to the pre-Hispanic era. Legend has it that the Incan warriors believed Mashua had anaphrodisiac properties and would consume the tuber to focus on becoming a better warrior rather than thinking about their families and wives back home. 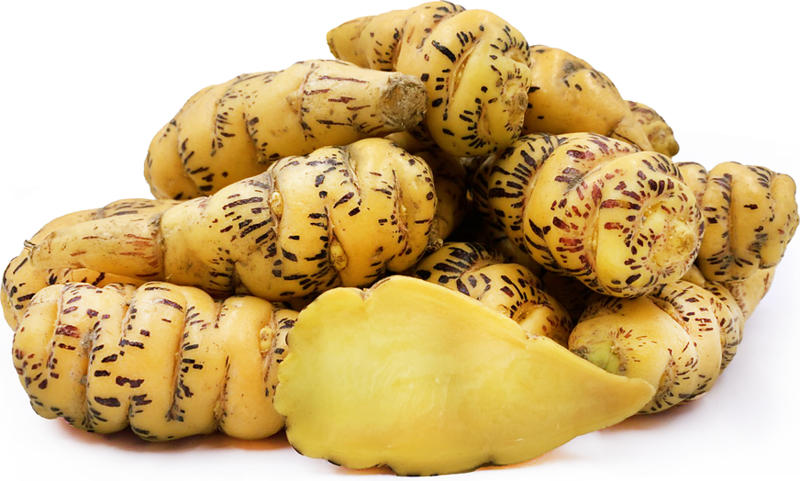 Today, Mashua is one of several tubers that are still commonly consumed in South America on a local level, but the tubers are not commercially cultivated on a large scale due to the reputation of the root being a “poor man’s food.” Mashua is largely used medicinally as it is believed to have insecticidal and antibiotic properties and is displayed beside other natural medicines and herbs in markets. Mashua is native to the Andes in Peru, with the first record of the tuber dating back approximately 1,400 years ago, and has also been found in multiple regions in Ecuador, Bolivia, and Columbia. It was then introduced as an ornamental to Europe around 1827 and eventually made its way into North America via explorers and trade routes. Today Mashua continues to be grown in home gardens and small farms and is available at local markets in South America, Europe, and in the Pacific Northwest of the United States. Recipes that include Mashua. One is easiest, three is harder.